The rock perimeter made bathtime a satisfyingly masochistic ritual. Clearly carrying inspiration from Japanese open-air baths, this massive saucer-like bath space has all the highlights necessary to transport you to an atmosphere of surreal tranquility. A glass divide sets the border between this and an adjoining room, while the white stone border of the bath is both practical and beautiful. Step out of the bath onto the natural surface and look forward to drying off in a place which feels like the outdoors. Soaking up the water, the stones stay clean and snow white, matched to the interior of the bath itself and the control panel beside it. This bath is not completely open air, but instead comes with the option of closing the room completely. In the photograph above, you can just see the pull-down blinds at the entrance to this space. 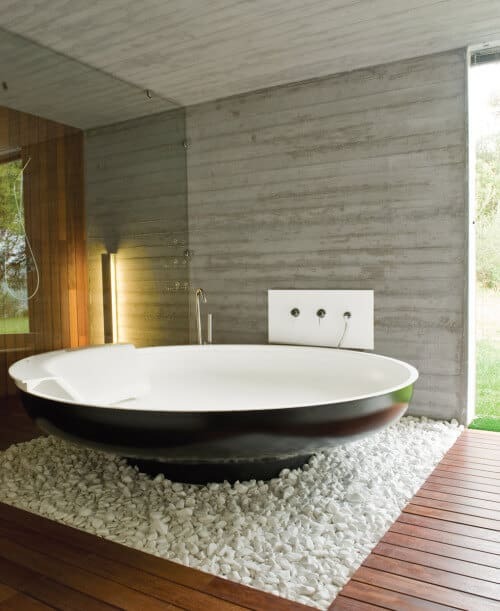 A tall, rectangular light perfectly emits a glow which suits the ambiance of this natural bathing space. Glowing through from the opposing side of the glass divider, you can rest assured that the light provides both warmth and sets a great atmosphere. Thanks to not being within reach of water, the level of elevation is ideal. Reclaimed wood lines the walls and ceiling, while a contrasting shade in a polished, professional veneer makes up the wood flooring. Together you have a space which captivates and constantly calls one closer towards the striking center bath.